THE GREATEST MATCH I'VE EVER SEEN ! ! ! One of the precious few perquisites of the soggy second week of this United States Open was the opportunity to watch endless replays of Jimmy Connors pumping himself up and putting the chair umpire down on his way to victory in his classic 1991 match against Aaron Krickstein at the National Tennis Center. 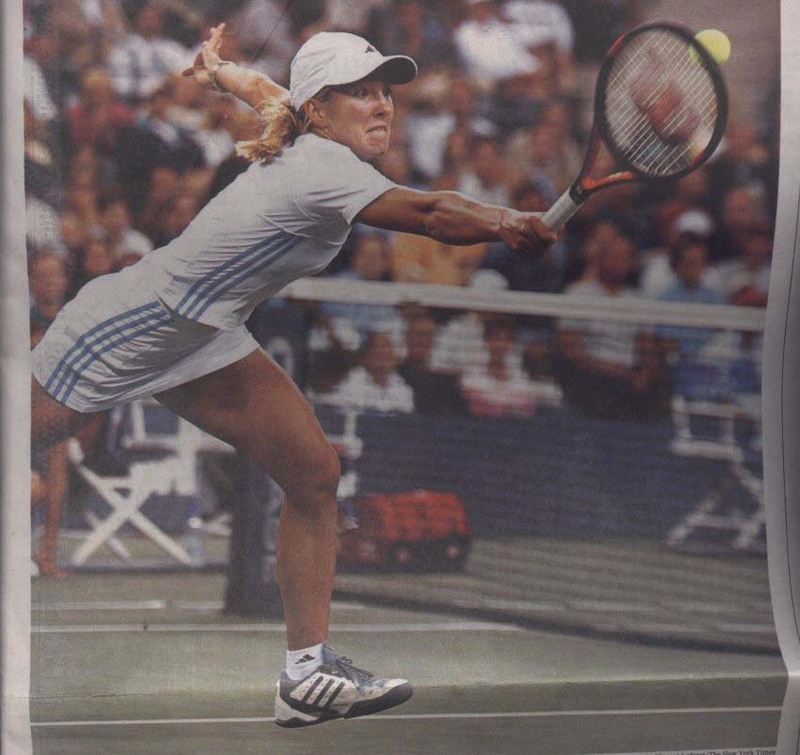 Perhaps Jennifer Capriati has been one of the few tuning in, because last night, in Arthur Ashe Stadium, she did a fine Connors impression in a classic Open match of her own with a fist-clenching, linesman-berating, winner-on-the-run performance that was missing only one essential element. She did not win, that honor, and it was indeed an honor after this three-hour-and-three-minute test of character, belonged to second-seeded Justine Henin-Hardenne of Belgium, whose 4-6, 7-5, 7-6 (4) victory over a clearly devastated Capriati earned her a place in her first United States Open final against her country-woman Kim Clijsters, the top-seeded player in the women's draw. The Open is accustomed to symmetry: The finals in the last two years have been all-Williams sisters affairs. But this year, the final will be between two Belgians. "I think a lot of people don't even know where Belgium is, I think, here," Clijsters said after her infinitely more routine 6-2, 6-3 victory over Lindsay Davenport in the evening's first semifinal, "I think this is a great way to create some attention for the coutry and for both of us, as well." Henin-Hardenne, who won her country's first Grand Slam title earlier this year by defeating Clijsters in the French Open final, certainly had Capriati's full attention. On 10 different occasions last night, she was within two points of defeat, but despite leg cramps that began affecting her serve at 3-5 in the final set and despite Capriati's combativeness, court coverage and baseline power, Henin-Hardenne refused to stop swinging through her one-handed shots. And after Capriati tried and failed for the second time to serve for the match at 5-4, Henin-Hardenne pushed the match into a tie breaker and jumped out to a 6-2 lead. Capriati saved the first match point when Henin-Hardenne slammed a backhand into the net. Capriati saved the second match point when Henin-Hardenne slammed a backhand wide. But Capriati could not save the third as she lunged for a backhand volley and struck it into the net. Henin-Hardenne dropped to the court, covered her capped head with both hands and then walked slowly to the net, where Capriati gave her a cursory handshake that was a fitting feflection of her disappointment, but hardly a fitting finish to the match. "It's hard to say, " Capriati said when asked whether it was more a case of her losing the match or Henin-Hardenne winning it. "I have to give her credit, the way she ws feeling, to just stay out there and try to win. But I feel I defnitely had the match in my hands. It was my match to win. I guess I beat myself." "I'm so tired," Henin-Hardenne said. "I gave everything I had. I was cramping, especially on my serve . During the point I was O.K., but serving was really hard. I just did my best."